The suns energy is converted by solar PV panels into electricity. This electrical current is known as DC or direct current. The DC current then travels through the cables that we will install to the systems inverter(s). It will then be inverted into AC current (Alternating Current) which is the same as we use in the home. 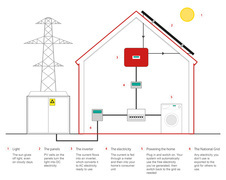 From the inverter it then passes through the generation meter into your fuse board where it will then be used in your home or sent back to the National Grid. 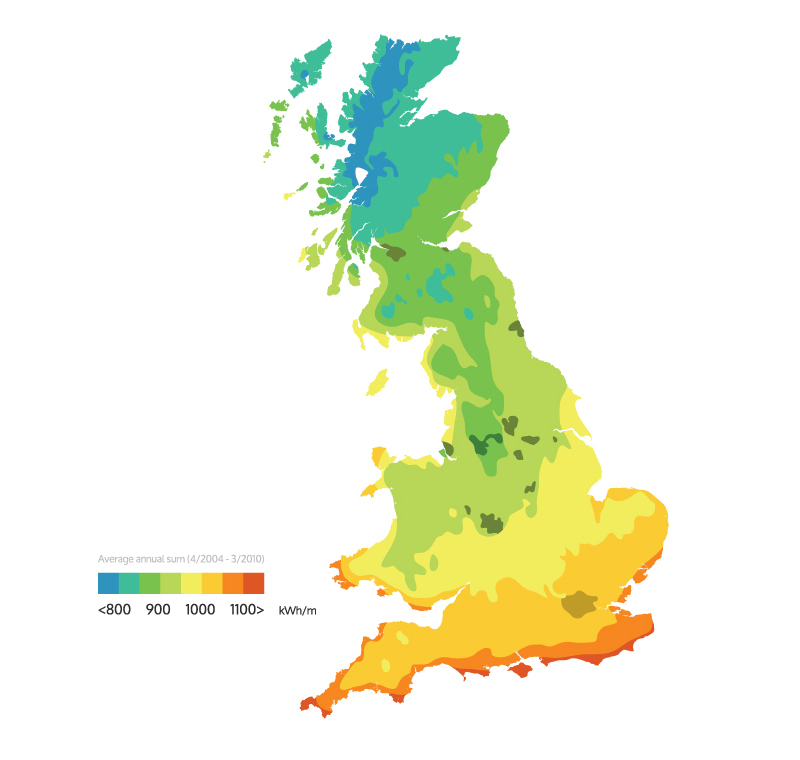 Many people are aware of the benefits of solar and of the fact that it is an efficient and effective method of powering a home, but assume that because the sun isn't as bright in the UK as we would like, that solar is pointless. This assumption is not true. Although it is true that solar is at its best when the sun is at its peak, the fact is, solar panels can still supply you with energy on a dark, cloudy day. Another common assumption is that the UK receives less sun than those in Europe. 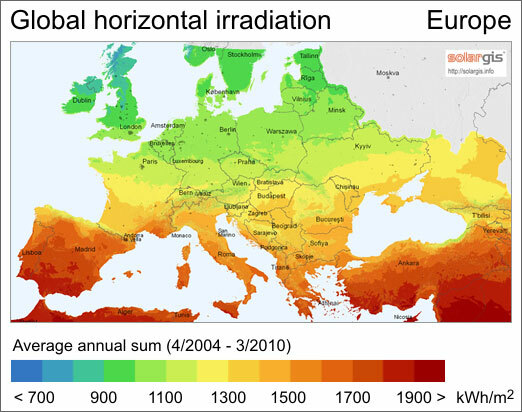 However, as you can see in the diagrams below, the radiation levels supplied by the sun in the South of the UK are actually the same as those found in much of Germany; the World's leading generator and consumer of solar energy. A solar panel is made up of a number of solar cells which each produce a small amount of energy. 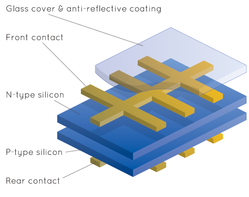 Each solar cell is made of 5 layers of material: the outer anti-reflective glass coating, a conductive front cover, N-Type Silicon, P-Type Silicon and a conductive rear cover. When the sun heats the Silicon, the electrons begin to move and flow from the top layer to the bottom. This flow of electrons creates electricity. The metal covers on the front and rear then create a circuit for the electricity to flow around and into the inverter. Then, the inverter converts the DC current into AC current, ready for household use.